The first step to creating your family tree is to collect the information you already have by sorting through documents in the filing cabinet and talking to relatives. Once sources in the possession of you and your family have been exhausted you will notice missing details and missing people. Finding all the necessary details and people can mean detailed, time consuming research. What if you don’t have for that? Fear not, the researchers at Genealogists.com do. Our researchers have the ability to assess census and vital records (birth, death, and marriage records) in the United States, Europe, and other corners of the globe to quickly build your family tree out for several generations. The ability of the research to be successful depends upon the nature of the records available and your own family history. Ancestors who stayed in one place are usually easier to trace than those who moved frequently. In the United States most people are most easily identified US census records after 1850 and those states which instituted the collection of vital records in the 19th century. Most European countries instituted civil records prior to the United States. Civil Records, like census records, are government records are collected irrespective of a family’s religious affiliation. In Europe, civil records combined with parish records (which often date back to the 1500s), can be used to positively identify family members. Of course, like in the United States, there are regions that are easier to research than others. Scandinavia has excellent records that are online and partially indexed. This is not the case with countries of Eastern Europe. It is possible that within a few months our researchers can establish a carefully sourced, family tree with several generations complete with images of the relevant documents and translations for records not in English. From this basic tree, you can identify which lines to pursue – either because they turned out to be complicated or because they particularly interest you. Contact Genealogists.com today and see how we can help you build your family tree, quickly and correctly. Walls prevent us from seeing what is on the other side; they divide our yard from our neighbor’s, our dining room from our kitchen. A genealogical brick wall divides us from our ancestors. Most genealogists will hit a brick wall for one of their family lines at some point in their research. The appearance of this barrier makes us wonder if we will be able to research this family line back any further. Brick walls take many forms: ancestors with common names, ancestors who moved frequently, unfindable maiden names and village names. These brick walls appear unsurmountable for many reasons. One may lack access to records, not have the necessary language skills, not have the research skills required for the problem, or may even be researching the wrong person. No matter the reason for your brick wall, there is no reason to give up hope. The professional researchers at Genealogists.com can help you understand the nature of your brick wall and devise a strategy to break through it. There is an absolute proven way to continue your research, whether through traditional genealogy or by using newer genetic genealogy techniques. Genealogists.com has over 4,000 professional genealogists as well as hundreds of Subject Matter Experts, including personal historians, private investigators, forensic scientists, DNA experts, religious leaders, university professors/scholars, and archivists. Because of this dream team, it is now possible to break through even the toughest research challenges. Because of our size and talents, we are not limited to the small percentage of records that are online nor to a few local repositories. We are able to access the world’s records wherever they are located and in whatever form – whether online or offline. FamilySearch estimates that over 90% of records relevant to family history research have not been digitized. Obliterate your brick wall by submitting a research request to Genealogists.com and unlock the power of collaborative research. We’re giving away 1 FREE DNA Analysis every month for the next 6 months (one analysis per winner)! Valued at $140 USD each. DNA testing has become an accepted tool for identifying ancestors and for verifying genealogical leads. DNA, nature’s instruction book for life, is passed down from one generation to the next. Consequently, every person shares snippets of their DNA with their ancestors and living relatives. Analysis of your DNA will allow our genetic genealogists to identify your DNA cousins. By comparing your paper genealogy with that of your DNA cousins, common ancestors can be identified and research challenges solved. DNA analysis is often the only way to answer complex genealogy puzzles and break through brick walls. These difficult cases can include ancestors with unknown parentage, who were adopted, or who had common surnames. Additionally, depending on the type of DNA test taken, you can verify the surname of a male ancestor, identify an individual’s ethnic background, and discover your long lost ancestor. Keep in mind that our ancestors may have known things about themselves that they didn’t want other people to know. Female ancestors may have hid the true parentage of their children, other ancestors may have disguised their non-white ancestry. Consequently, clients should be prepared for unanticipated results. Any unforeseen result can be placed in its proper perspective by our staff who can evaluate both your paper genealogy and biological ancestry. Genealogists.com was the first major genealogy research firm to combine the science of DNA testing with traditional family history research. The talented team of DNA experts at Genealogists.com provide personal assistance to individuals and families by interpreting your genetic results, from any of the companies (23andMe, AncestryDNA, and Family Tree DNA) in the context of traditional genealogical information. Our DNA experts have a passion for genetic genealogy, a genuine love for people, and a gift for making the technical understandable. Many people who left Europe between the years between 1880 and 1930 were from Eastern Europe. Historically, this region was dominated by the Austro-Hungarian Empire, Germany, and Russia. The territory governed by these entities include the modern countries of Poland, Ukraine, Slovakia, the Czech Republic, Russia, Estonia, and many others. European warfare and diplomacy over centuries has meant that most of the countries in Eastern Europe have seen repeated border changes, experienced settlement by different peoples, and been home to people of many religions. City can access the Family History Library’s growing microfilm collection of Eastern European records. Additionally, our researchers on location in Eastern European cities have the ability to visit archives in person. Contact Genealogists.com today and ask how we can help you locate your Eastern European ancestors. One end product of family history research is to create a genealogy or pedigree – a document which starts with you and links you to as many direct ancestors as you can find. Pedigrees can be impressive and fun to look at – a short hand guide to your ancestors. What pedigrees do not include are the stories we learn about our ancestor’s lives, nor can they show us how our ancestors connect to historical events. Genealogists.com can help you identify the ways in which you can tell your family story by painting a picture with words, rather than by placing your ancestors in boxes in a pedigree chart. You probably already have most of what is needed to start writing a family history, including census records, newspaper clippings, marriage records, and family stories. These records combined with your own interests and goals, will help direct the scope of your family history. You may be interested in detailing your family’s arrival in America or their journey out of slavery. Or you may want to explore the history of one family line to share with relatives at a family reunion. Don’t worry about the number of documents you have regarding an ancestor: writers can feel overwhelmed by having too much information as well as by having too little. 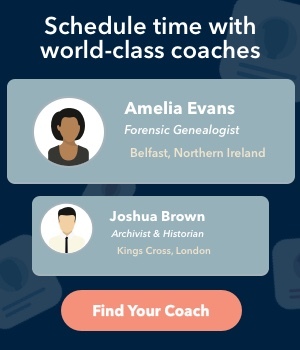 The writers at Genealogists.com know how to combine the individual details of your ancestors’ lives with historical research to write a history that will bring life to your ancestor’s world. Humans move. It’s what we do. So chances are no matter where you live in the world, and especially if you live in regions colonized by Europeans, you likely have ancestors who came from somewhere else. Genealogists.com can help you bridge the ocean from where your ancestor settled back to where they came from. Uncovering your immigrant ancestor’s origin, known as a point of origin project, requires examining the documents created by and about your ancestor after their arrival in their new country. These documents might include ships’ passenger lists, census records, obituaries, church records, and naturalization papers. The ultimate goal of this records search is to find one document that names the immigrant ancestor’s hometown. Knowing your ancestor’s specific hometown, birth date, family members, and date of arrival are crucial to correctly identifying your ancestor in their home country. When the documents related to your immigrant ancestor do not reveal enough information about their point of origin, Genealogists.com is able to take the search to the next level. Once all records about your immigrant ancestor have been exhausted, their point of origin can often be discovered by researching the lives of their friends and extended family members. Our ancestors tended to travel to new places either with, or to join, people they knew from their home villages. Finding your immigrant ancestor’s home village requires determination and, sometimes, a little luck. Even if a specific hometown cannot be identified for your immigrant ancestor, the documents uncovered during this search will help tell the story your family’s arrival in their new country. Whether you live in Australia, the United States or anywhere in between, the researchers at Genealogists.com have the skills to find your immigrant’s point of origin.